Ottawa artist Norman Takeuchi is a third-generation Canadian who only recently began to explore his Japanese ancestry. The result has been the creation of art that is a juxtaposition of contemporary Canada and ancient Japanese iconography. Takeuchi’s newest exhibition is at the rental and sales branch of the Ottawa Art Gallery and is called On the Edges of Noh. Noh is a stylistic form of Japanese musical dance-drama featuring elaborate masks and dating back to the 14th century. Performers in Noh theatre wear wooden, often gruesome masks — artwork in their own right — that reflects their gender and stage character. 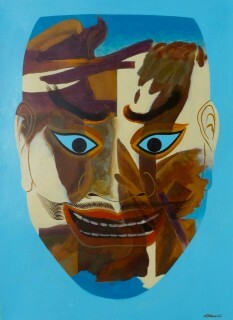 Inspired by photographs of traditional Noh masks, Takeuchi has painted a series of portrait-like Noh masks of his own. Irregular abstract shapes — a reflection of contemporary Canada — float across the masks like clouds. 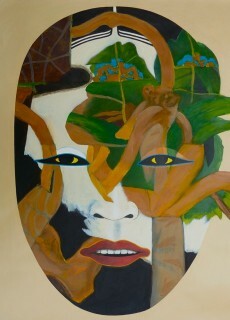 The important, expressive details of the masks are not hidden by the abstract shapes. 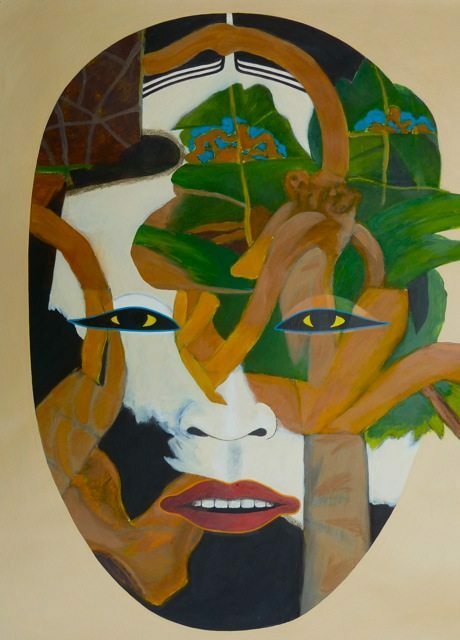 Instead, the abstract shapes tend to soften the frightfulness of the masks and give them a friendlier appearance. Takeuchi has increasingly been making waves with his hybrid Japanese-Canadian art. He had a very successful exhibition last year at Cube Gallery, his dealer, in which similar painted abstract shapes collided with various manifestations of Japanese iconography. Some of the paintings in that show were acquired by the Canada Council Art Bank. The Ottawa Art Gallery rental and sales division was interested in giving Takeuchi an exhibition to complement the gallery’s two main exhibitions opening Sept. 22. One of those exhibitions, The Seasons, involves Canada’s most famous Japanese-Canadian artist, Takao Tanabe. The other is a multi-artist aboriginal show called Decolonize Me, which explores similar themes of identity found in Takeuchi’s work. Among the artists involved in Decolonize Me is Ottawa’s Bear Witness, an artist and DJ. The Tanabe show includes five segments of a giant abstract mural; the West Coast artist created the work in 1966 at the invitation of architect Hart Massey for the Sir John Carling Building, which was the federal Agriculture Department’s Ottawa headquarters at the time. The building has been condemned and the mural removed. The government apparently hopes to remount the mural some day in a different building.